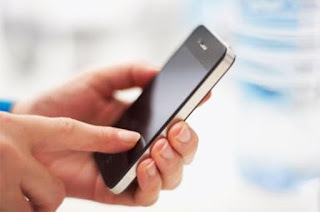 Home Body Disorders Is Using A Smart Phone Really A Smart Idea? We live in an age of technology and smart phones. Today, people spend more time using their phones and tablets than they practically do with the people sitting around them. Almost every person today owns some or the other type of smart phone or tablet. Technology has advanced and so has the usage of these devices. According to a recent study, people aged between 8-38 years spend an average of 8-11 hours every day in using their smart phones and electronic devices like tablets, laptops, and computers. Smart phones are changing the way we access entertainment and information. Modern life requires us to check our phones or tablets numerous times a day. Let’s throw some light on how using a smart phone affects your body! 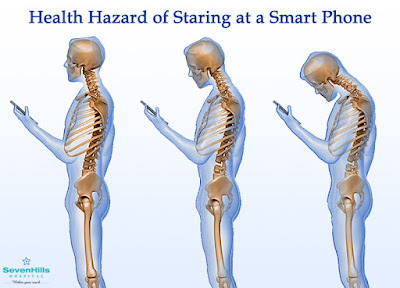 Looking down at the phone and dropping the head forward results in a change in your body posture and mechanics: a change that is unhealthy and even dangerous. Ideally, the line from your neck to the shoulder should be aligned straight, but as you look down at your device and as the angle increases, the natural curvature of the neck changes. Your shoulders curl inside or lift up towards the ears, you get a hunched back, and your muscles are strained, causing wear and tear on the structures of the neck; in addition to causing chronic neck pain, shoulder pain, and back pain. Continuous viewing of such devices affects your vision as well. Furthermore, such poor posture becomes a habit, and you tend to have a poor posture even while you’re sitting, standing or walking, or are in a static position. This causes stiffness and upper body pain. Over time, this also affects your spine, causing middle and lower body pain. In some cases, constant texting or accessing such devices also leads to pain and numbness in the hands, fingers, and muscles. Thus, in no time, this one habit negatively affects your overall health and wellbeing. Doctors have also recorded an increase in the number of patients – especially in kids and young adults – who complain about such bodily problems. If unattended to, such a poor posture also affects the trapezium muscle in the back, which can also lead to complete stiffness and intense pain, often resulting in bed rest for a few months, or a multiple months’ medical course. Pay attention to these little tricks so that you save yourself from the pain and injury caused by dropping your head while using the smart phones and tablets. Practice proper posture. Straighten up so that your ear to shoulder forms a vertical alignment. Don’t slouch. Slouching reduces the lungs’ capacity by 30%, causes pressure on the organs, and also leads to gastrointestinal and vascular problems. Stay hydrated. Keep drinking sufficient water so that there is enough fluid to keep your body hydrated and well-functioning. Stretch yourself. Try shoulder extensions. Push your neck and back backward so that your shoulders are in alignment with your ears. This will ease your back painand thus, body pain. Raise the device. Rather than tilting your chin down to view your smart phone, raise your device to eye level. This will free you from muscle pain and the subsequent neck and spinal pain. Use a desktop. For extended work, use a desktop. Be sure to arrange the monitor screen at an eye level to avoid the same problems caused in the point above. Take a break. Take a walk. Walk around and away from your devices. Make it a point to take a little walk every 20-30 minutes. Maintain a right posture while doing so. This will keep you away from your smart phones and other devices and will relieve you from the continuous viewing of the same. To avoid this trauma and to lead a healthy life, stop carrying out your life by text. Do not get carried away by your smart phones. If you’re already in pain, visit a doctor immediately. Do not delay your health illnesses. customers with a tag 'My Human Resources which is a choice https://liteblue.me/ might intend to find out about.eRetire is the self-service application.